As an employee, taking leave (vacation) is something you really look forward to. On the other hand, as a manager/business owner, managing leave can be difficult – you need to back fill their shifts and ensure enough coverage for a smooth operation. At the same time, leave is a business liability and can be easily forgotten that it’s a hidden labour cost. At Deputy, we’ve been helping you manage your leave workflow from the beginning i.e. applying for leave, approving leave and using open shifts to back fill shifts for those who have taken time off. Traditionally, leave management has been left with payroll and most often, people don’t even check their leave balance before applying for time off! It’s a disjointed process. But today, we’re taking leave management one step further by introducing leave balance in Deputy! “How much annual (vacation) leave can I take?” – The question on every employee’s mind before they request time off. “How much annual leave is he entitled to?” – The question on every manager’s mind when they receive an employee’s leave request. Both of these questions can now be answered with Deputy! While requesting or approving time off, you and your staff can see leave balances in total hours (and days) in one place. No more searching through payslips or going back and forth between Deputy and your payroll service! Just ensure you’ve enabled staff to see their leave balance in Deputy. Wouldn’t it be great if you could simply flick a switch and have Deputy pull and display employee’s leave balances straight from your payroll service? With our new sync leave balance extensions, you can do just that! If you’re using one of our payroll partners such as Xero, MYOB AccountRight or Bamboo HR (ADP coming soon!) 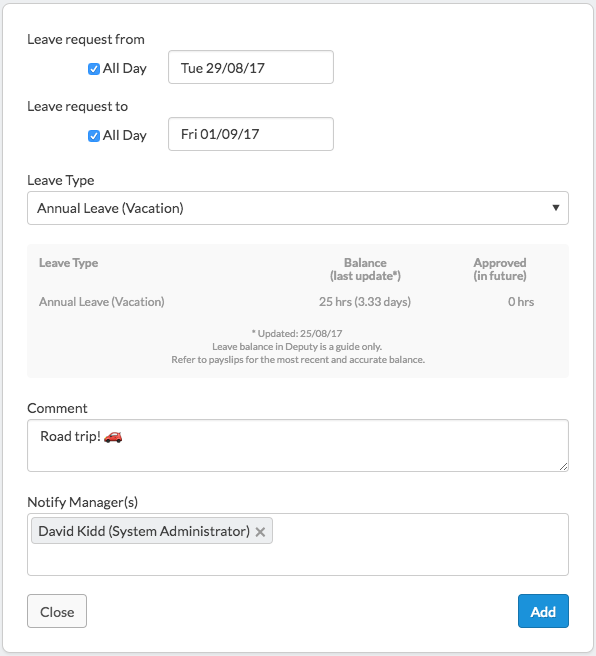 to manage leave/vacation, you can now approve leave requests in seconds by syncing employee leave balances with Deputy. Once enabled, Deputy will automatically pull leave balances directly from your nominated payroll service. I Can’t Sync Leave Balances WIth Deputy, Though. What Can I Do? No sync? No worries, we’ve got you covered. 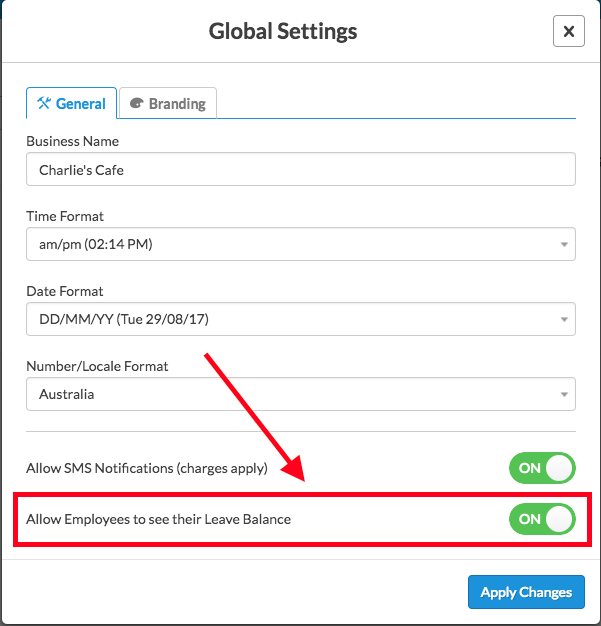 You can bulk import your employee’s leave balances right from your People page. We’ve also added a new extension to our library to help manage both leave balance deductions and accruals. 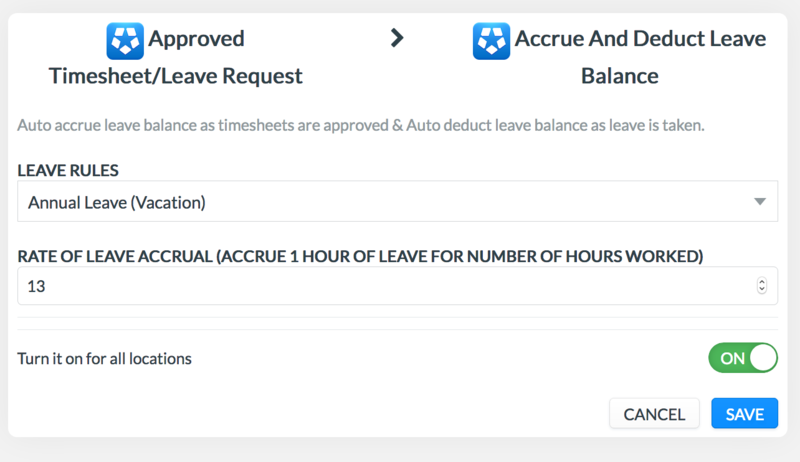 When enabled, Deputy will automatically deduct from employee’s leave balances when leave is taken and accrue hours on top of their existing leave balance when timesheets are approved. To set an accrual rate for a leave type e.g. Annual (Vacation) Leave, enter for how many hours worked, staff will accrue 1 hour of leave. For example, here at Deputy I work 40 hours a week and accrue a total of 160 hours of Annual Leave per year. So, 40 hours X 52 weeks = 2080 hours worth of work per year. Now, dividing 2080 hours by 160 hours of accrued leave, my rate of leave accrual calculates to 13. This means for every 13 hours I work, I accrue 1 hours worth of Annual Leave. Need a hand with setting up this Deputy extension or calculating your rate of leave accrual? No problem, let us know! For a quick glance of staff and what their leave balances are, you can now use the ‘Also Show’ function on the People page to display current leave balances. You’ll also be able to report on leave balances and export the data, using our Custom Report Builder. Coming soon! 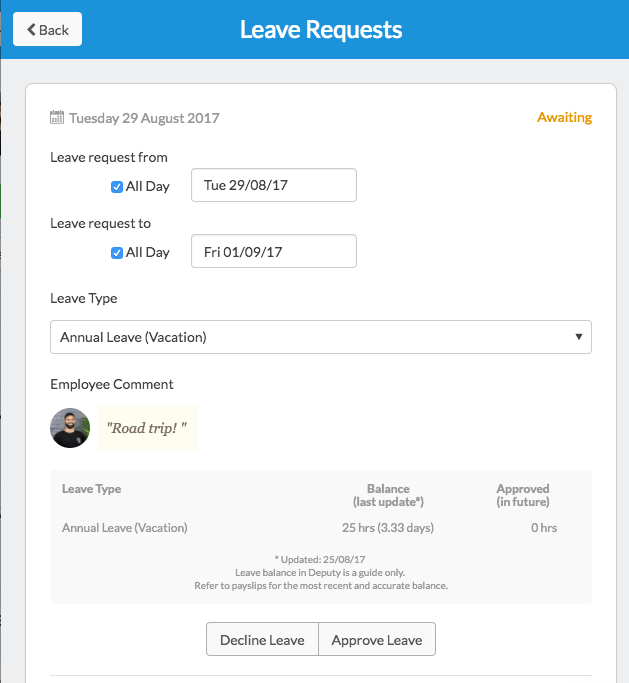 With this update, managing leave and time off requests has never been easier. Both you and your staff can see exactly how much time off they’re entitled to, helping you approve (or reject) time off requests in seconds. Save time without needing to scurry back and forth between Deputy and your payroll system – just sync your leave balances into Deputy and we’ll help you keep an eye on it. Let Deputy take the worry out for when your employees go on holiday. This is our commitment to continue improving leave management for you. If there’s any issues with syncing, importing or displaying leave balances into Deputy, just let us know! We’d love to hear your feedback. The post Leave Balances Now In Deputy appeared first on Deputy.